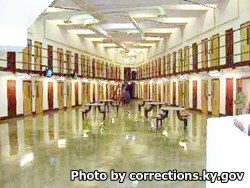 Little Sandy Correctional Complex is located in Sandy Hook Kentucky, part of Elliott County. It is a mixed custody prison that can house over 1,000 adult male inmates. In addition to two medium custody general population living units, Little Sandy Correctional Complex has a minimum security unit, and a maximum security special management unit. Adult education programs give inmate the ability to earn a GED, obtain an adult basic education and learn to read. Little Sandy Correctional Complex has many vocational courses where inmates can earn up to 90 days educational good time once completed. These vocational courses include carpentry, fiber optic cabling, Microsoft Office, horticulture, construction management, small engine repair and more. Certifications can be obtained upon completion of these courses which give the inmate a much greater chance of success once released. Regular visits for general population inmates occurs on Saturdays, Sundays and state designated holidays in two sessions, a morning session from 8:30am-11:30am and an afternoon session from 12:30pm-3:15pm. Non-contact visits occur on Saturdays and Sundays in three sessions, from 8:30am-10:30am, 12:30pm-2:30pm, and 1pm-3pm.